Recruitment Scams - How to Identify Them? It has recently come to our notice that some fraudsters are impersonating as HireTale and running recruitment scams, asking money from candidates for job offers in reputed companies. While we have reported such email ids, phone numbers and bank accounts to the cyber cell, it is extremely important in this cyber age to protect yourself against such phishing attacks. Mention of a company/portal name in an email does not make it official. Anyone can create a Gmail/Yahoo/Rediff email with any name without any ownership proof. 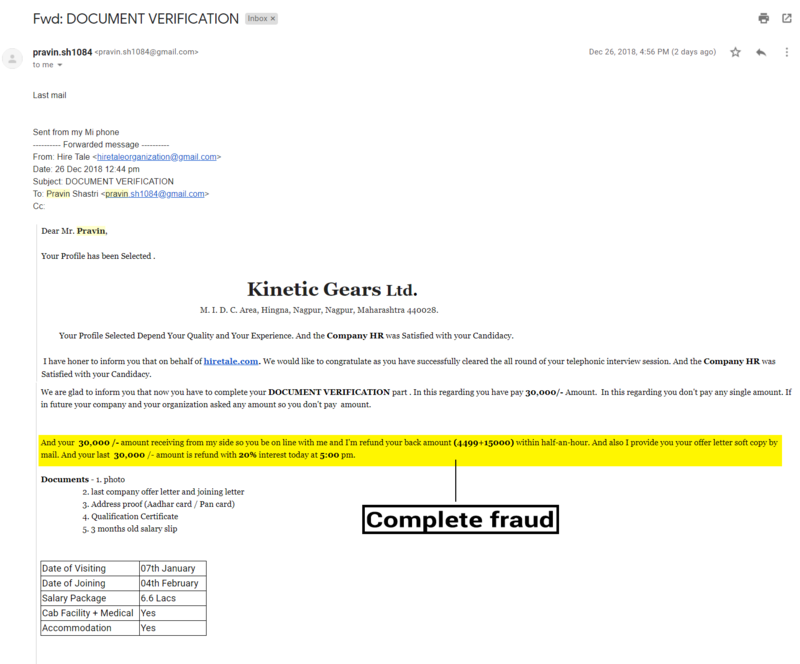 The way scamsters did in this case, creating hiretaleorganization@gmail.com with Hire Tale name. This has no link to our company. 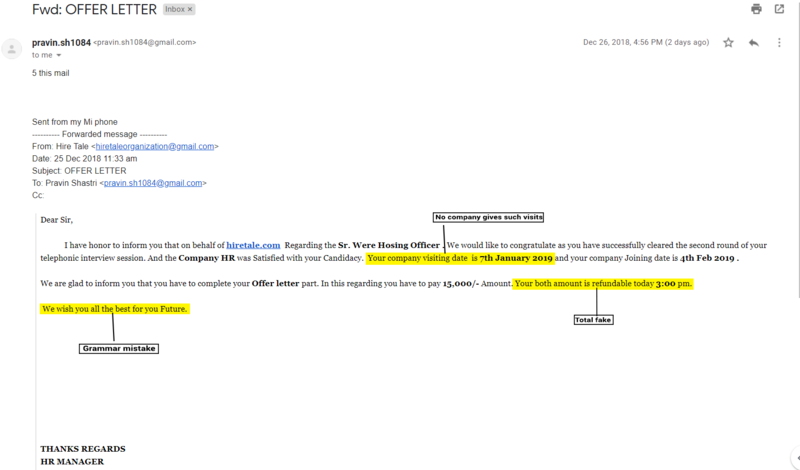 Even if an email seems to come from an official domain (like someone@hiretale.com), make sure to check email header of the email to be assured of authenticity. For example in Gmail (https://support.google.com/mail/answer/29436?hl=en), you would see “spf=softfail (google.com: domain of transitioning someone@hiretale.com does not designate 2a01:5e0:36:5001::22 as permitted sender)”. No company charges any money as fees from the candidate. Beware of paying any amount in the pretext of registration/interview/training program/joining/security money. 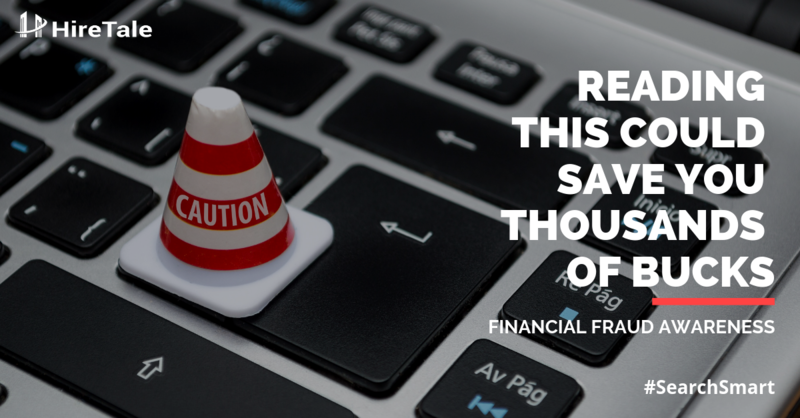 Look for obvious signs of fraud in the email. There will generally be spelling and grammatical mistakes, and improbable promises of return/interest on your money. Generally, there will not be any name or contact number mentioned in the email. If someone claims to represent a company, try to search for that person online. Reach out the concerned company through their official site or public profile pages to verify that person’s identity. These recruitment frauds are more common than you think. Do not proceed if you are getting calls from multiple numbers by the same person/group. They are disposing old SIM cards and using new disposable ones to avoid being tracked. If the interview is too simple/generic, it is an illusion to convince you as selected and then demanding money for the job. Already duped by such recruitment scam? Immediately report a complaint with the cyber crime cell in your city with all details of communication channels. Email ids, phone numbers, call recordings, and bank/wallet account details. If there is no cyber crime cell in your city, you can lodge a complaint at the nearest police station. A police officer is bound to record a Zero FIR from the complainant and forward the same to the police station in the jurisdiction of the place where the offense was committed. In case they deny to lodge a complaint, you should approach the commissioner or the city’s judicial magistrate. Report the financial transaction to the respective platform. Call the customer care and report the transaction as fraud. Mark all such calls as spam on Truecaller, and emails as phishing attack through your email platform. Your contribution will help other users to avoid such cases. Remember that job is not a commodity which can be bought by paying money. However needy/desperate you might be for a job or better opportunity, don’t get tricked into scams. Share this knowledge with your friends and colleagues as well to help them avoid such scams. Wish you a safe job search! Interview Tips, Uncategorized recruitment, Recruitment Scam Awareness. permalink.